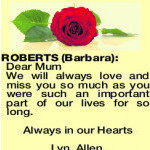 Family and friends are warmly invited to attend a Celebration of Life Service for Barbara Ethel Roberts of High Wycombe to be held in our Chapel, 401 Great Eastern Highway, Redcliffe on FRIDAY (12.4.2019) commencing at 12 noon. 20.7.1920 — 7.4.2019 Loving mother of Greg and Lyn, mother-in-law of Helen and Allen, grandmother of Tracey, Glenn and Geoff. Passed away peacefully on 7th April, aged 98. We will always love and miss you so much as you were such an important part of our lives for so long. Loved and respected elder Sister and Sister-in-law of Ronnie and Jack (both dec). 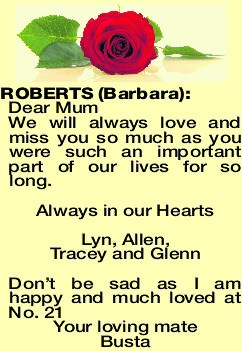 Dear Aunty Barb of Marilyn, Larry, Helen, Kerry and their Families. Loving condolences to Greg and Helen, Lyn and Allen and their Families. Sadly, we grieve with you.